Mickey Truck Bodies was #71 on the NC 100 list. 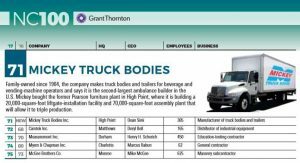 Mickey Truck Bodies has been named to the 2017 Grant Thornton North Carolina 100® (NC100), which ranks the state’s largest private companies by revenue. The complete list was released in the October issue of Business North Carolina and can be viewed at GrantThornton.com/NC100. Mickey is the only High Point-based company to make the 2017 list. Mickey Truck Bodies has been privately owned and operated by the Mickey family since the company was started in High Point, NC in 1904. Today, Mickey manufactures high quality all-aluminum truck bodies and trailers for several industries, including beverage, automotive battery, propane tanks, moving, emergency services and oil & gas. The Mickey team numbers over 400 across its 6 U.S. locations covering approximately 500,000 square feet of manufacturing and office space. This month, Mickey expanded its manufacturing capabilities by opening a plant in Salem Township, PA. The company also recently constructed a new liftgate installation facility adjacent to its main manufacturing plant in High Point, NC.